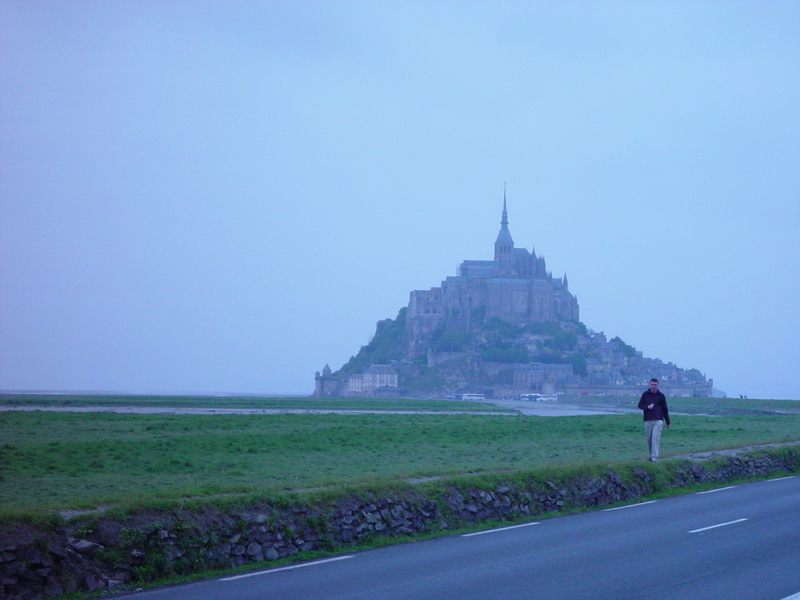 The next place on Carolyn’s Must See list was Mont Saint Michel which I’d never heard of. However, friends, that is the best way to first see this amazing place for the first time – with virgin eyes. We were still miles away when it began to take shape through the mist hanging over the marshy farmland. It looked like a pyramid. Or like the hat of a Chinaman rising from the sea. As we got closer the castle walls came into view, clinging impossibly to the sides of a rock. Who would built a castle on a rock in the bay, I thought. Later I learned it was not a castle but an abbey, built in the eighth century by the bishop of nearby Avranches. His motivation was self-preservation. It seems the Archangel Michael really, really wanted an abbey built on what had heretofore been a useless mound accessible only during low tide. And so, when the bishop ignored the archangel’s demands (delivered to him in dreams) Archangel Michael blew a gasket and thrust his pointer finger through the bishop’s skull. (bishop’s skull info here). Mont Saint Michel isn’t easy to get to, even today. There aren’t a lot of signs, the roads are two lane asphalt and the nearest town, Avranches, doesn’t exactly pimp itself as the “Gateway to Mont St. Michel” so you can imagine what it was like back in 1970. Because I knew nothing about the place, I went along with Carolyn’s calculation of a day’s travel time. She was wrong. It’s located in at southern tip of Normandy (the northwest corner of France). Of course it didn’t help that we started out late after a big breakfast with Hans and Klaus. “The French don’t really eat sandwiches,” I warned as we made a U turn. The farmer smiled enthusiastically as we approached. “What do you sell?” I asked in french. 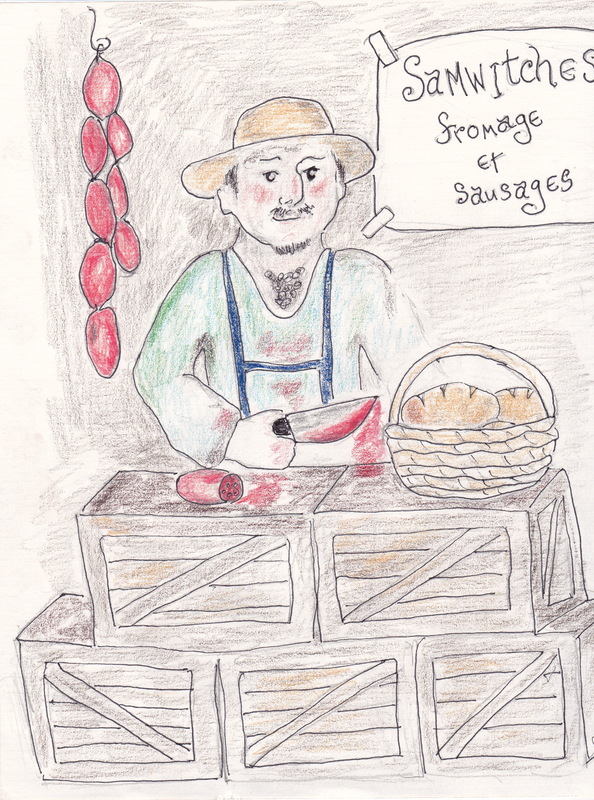 “Samwitch de sausages et samwitch de fromages,” he replied. Carolyn ordered the sausage samwitch and I ordered the fromage. 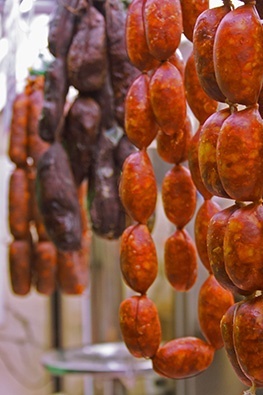 He grabbed a fat sausage hanging from a hook behind him and with grimy hands and a bloody cleaver hacked off a piece on an old crate. Then he took the same cleaver and hacked off the end of a baquette. Proudly he handed the resulting samwitch to Carolyn. Blood soaked through the bottom layer of bread as with ashen face she paid him and quickly walked back to the car. Mine was a little more appetizing – although there were bits of straw in the soft cheese and it smelled funny. A few miles down the road we discarded Carolyn’s samwitch. I offered to share mine but she claimed the cheese was rancid. I suspect it was the memory of the farmer’s grimy hands that caused her appetite to disappear. 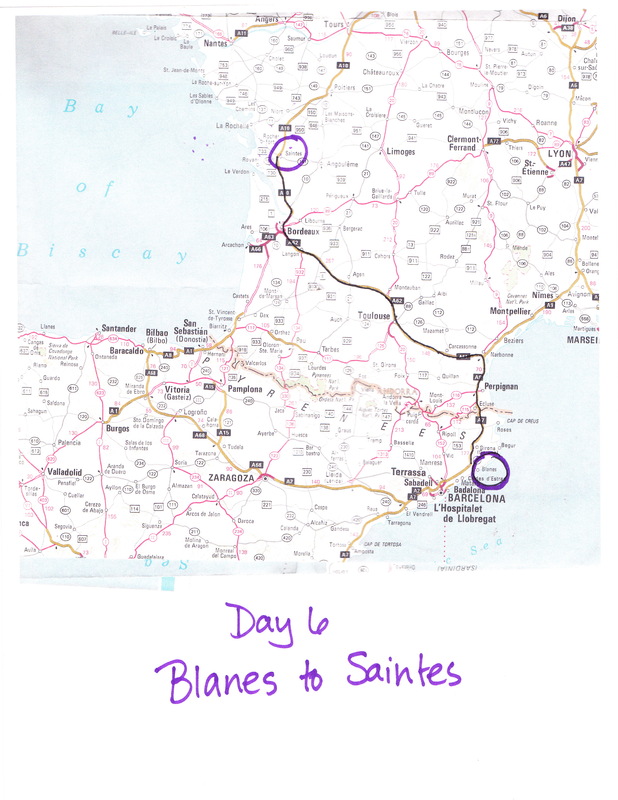 That night we stopped at the small town of Saintes, too exhausted and hungry to go any further. There we lucked out. Dinner, breakfast and a room with a tub for the equivalent of one dollar and fifty cents in an old hotel that was shabby but clean and quiet. Next – More boys! These time three Italian lads in a Ferrari on their way to London. 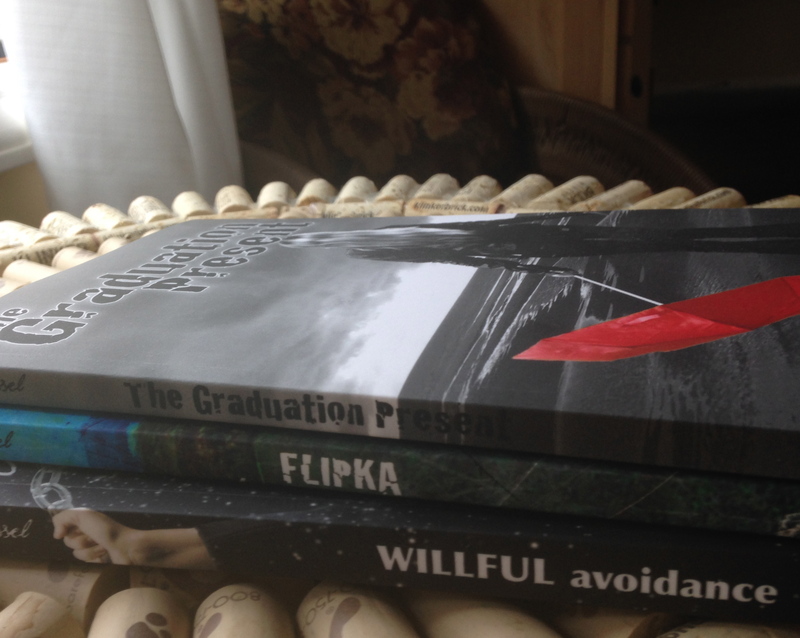 This entry was posted in Posts, The Graduation Present and tagged Mont Saint Michel, Normandy, samwitches, wacky travel tales. Bookmark the permalink. Graphic description Jan. Your account of Carolyn’s sausage samwitch was stomach-churning. Thanks Colm! Even after all these years I can still remember the look on her face. Never eat from the roadside!!!!!!!!!!!!!!!!! Now I’ve lost my appetite! I haven’t been able to eat a salami sandwich since then! After your description I understand why.